Meet the cool kid in town when it comes to the frontline of what is hot and trending in the food world. Sushi Burrito & Co. screams for your attention and here's why you should answer the call. The thing about fusion cuisine is that it either works beautifully or it belly flops terribly. There is no in-between. I’ve got a long list of really bad ones (ask me sometime) and then I have a shorter list of really good ones that I’ll share with you. Guess where Sushi Burrito & Co. fits in? At the top of my good books. Take my word for it. I’ve eaten my way through the good, the bad and the ugly when it comes to Jozi eateries and this little gem in the north is worth holding on to. But what exactly is Sushi Burrito & Co.? Well, it acts as the guinea pig in bringing cool and quirky dishes to Melrose Arch. It’s a mixture between Japanese cuisine and Mexican cooking. Yup. Imagine sushi and burritos smashed together to create – just like the name states – sushi burritos… Well, sort of. This restaurant wears its namesake quite well. A sushi burrito is pretty much just a massive burrito made of rice and seaweed filled with fresh sushi fillings, such as tuna, cucumber and wasabi sauce. I recommend that a first timer at this interesting eatery try out the raw tuna burrito, which is made up of tuna sashimi, crispy fried onion, cucumber spaghetti, cilantro (that’d be coriander leaves), avocado, spring onion, romani lettuce, sesame seeds, wasabi mayo, and eel sauce. You can also ask them to roll your burrito in their “famous crunch”, which is cheesy corn sprinkles – so good. The cool thing about Sushi Burrito & Co. in Melrose Arch is that their menu is packed with cool stuff. 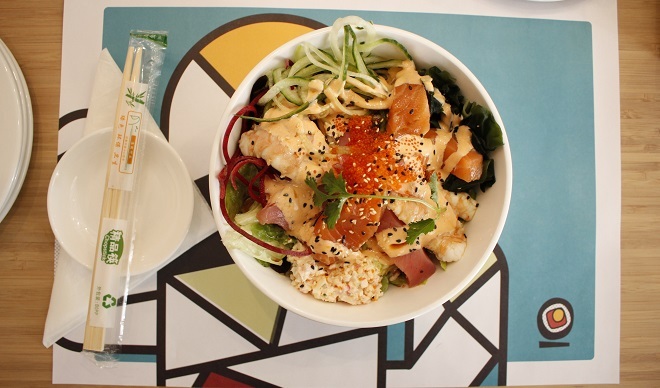 The owner, Jad, prides himself in being one of the first to serve pōke (pronounced poke-ay ) bowls in South Africa. Pōke, a food craze that originates from Hawaii, is a colourful and super healthy raw fish salad. It’s pretty much the ordinary house salad’s cool cousin who lives by the ocean, learned to surf at a young age and was born with blue eyes and a six pack of abs. Its looks are most certainly in competition with its taste. Another popular menu option at Sushi Burrito & Co. is their bao buns. 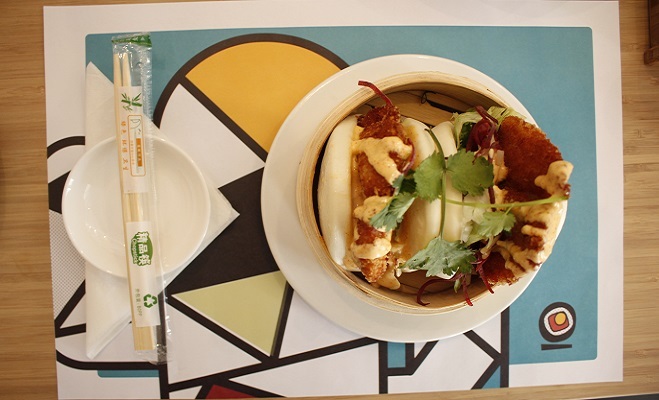 We all love a good steamed bun, and at Sushi Burrito & Co. you can get your fill. Each order of bao buns is served in a bamboo steamer, which adds authenticity to the experience. These buns are so good that I couldn’t just have one serving. I jumped head first into the panko-crumbed chicken breast buns (stuffed with lettuce, sliced onion, beetroot spaghetti, coleslaw and curry sauce), and the Subuta pork buns (ginger soy marinated crispy pork, onion, capsicum, carrot, cabbage, spring onion, been sprout, sriracha chilli and sweet and sour BBQ sauce). These buns should come with a warning though,as they are off the charts good. That is my unbiased opinion. It really is super tasty. And that goes for the whole experience I had at Sushi Burrito & Co. It’s a great place to grab lunch or hang out with old friends. The décor is what a great Instagram feed is made out of. The whole restaurant looks like something out of a Condé Nast Traveller expose on Tokyo… except it’s in Joburg. Much thought has gone into the whole restaurant – from décor design to the construction of the menu. The only thing is, and this is a good thing in a way, Sushi Burrito & Co. get super busy during lunch time. Try to get there just before or just after the rush. But it should also be stated that this does not take away from their service at all. I’ve been there a couple of times and every time I’ve not waited more than eight minutes for my order. That’s not bad for good, fresh food. Check out this awesome video we shot at Sushi Burrito & Co. There's a new way to enjoy sushi and that's wrapped up in a BURRITO! Have you tried Sushi Burrito & Co. SA yet? Tag a buddy you'd split this burrito with! Have you been to Sushi Burrito & Co. in Melrose Arch before? Let us know all about it in the comments section below. Sharing is caring, so show this review to that sushi-crazed friend of yours.